This is a highly prized and unusual dish. If you are looking for a recipe to impress seafood-loving guests, this is definitely one to try. 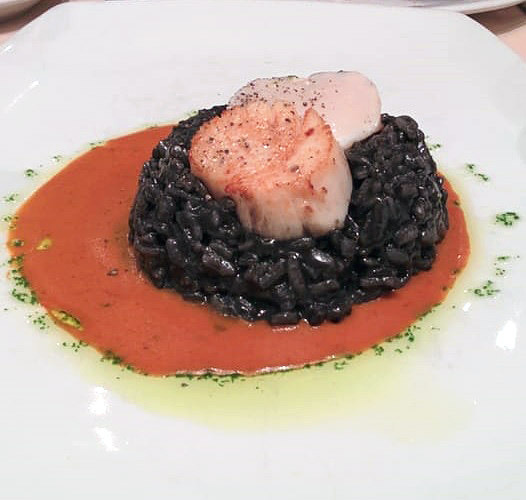 At upscale, Capannina restaurant in Cow Hollow (San Francisco), add their touch to the black risotto with their southern Italian touch. Enjoy! Wash the scallops in cold water & pat VERY dry with a paper towel. Sprinkle with S&P. Set aside. Bring the vegetable stock to a boil & reduce to a simmer. Heat TWO TBS of olive oil & TWO TBS of butter in a stock pot over med-high heat. Add the shallots or onion & saute until soft & just beginning to brown. Add the rice & tomatoes & stir for a minute or two. Add the garlic & saute one minute. Add the wine & then the ink & red chilies & crushed red pepper (if using). I added the ink in increments until it got the nice rich black. You may or may not use all the ink suggested – your call. Add the stock 1/4 cup at a time – letting it get absorbed before adding the next cup. Stir the rice the entire time. Reserve about 1/2 cup stock. Season with S&P. Test that the rice is cooked & then cover it & remove it from the heat. In a frying pan, heat 1 TBS olive oil & 1 TBS butter (more if you have more than 4 scallops) and heat on high until very hot. Add the dry scallops. They should sizzle upon contact with the oil. Do not fumble with them. Let them sear 1-2 minutes each side – depending on their thickness. Ideally – they should only be moved once – when you flip them. They should be crusty on two sides by a bit translucent in the center ( bit rare) – unless you like them cooked well done. Leave them on longer for a well done scallop. Know they will keep cooking a bit even after removed from the heat. Stir the remaining stock into the risotto & stir. It should be what the Italians cal “all’onda.” That means “wavy” or “with waves.” The risotto should be creamy enough that tapping the bottom of the plates makes it spread out. Plate the risotto, top with scallops & chopped parsley (and chopped red chilies or tomatoes) as garnish. 50% OFF – Try our Super-Premium Greek Wine Today!